Shijiazhuang Foreign Language Education Group is a modern school. Principle Qiang Xinzhi’s creative education idea and spirit are the basics of the school’s development. The organization of the symphony orchestra embodies the leaders’ far and high education policy. 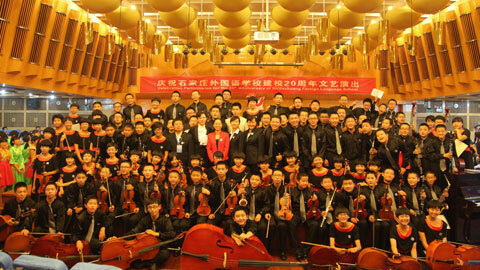 As the only one of its kind in Hebei Province, Shijiazhuang Foreign Language School Student Symphony Orchestra (SFLSO) was founded in December 2002. Since then, aiming at broadening students’ horizons, improving their aesthetic taste, nurturing their sentiment and training their specialty andability to promote all-round development of students, SFLSO, with the purpose of reaching the top in all aspects, has been trying the best to set up a first-class stage for students to show themselves. Since establishment, SFLSO, with its nearly 100 student players, in the loving care of leaders at all levels, with strong support from all sides and under the guidance of experts, has greatly and continuously improved its performing level. For many times we, on behalf of the province, the city, the district and of course, the school, gave more than 100 exchange performances with student orchestras from Japan, Sweden, New Zealand, Canada, Singapore, the United States and other countries, in which altogether over 100 pieces have been played. All our performances are well-received among parents as well as students and have a far-reaching influence in society. In the summer of 2009, SFLSO took part in the 38th Vienna International Youth Music Festival and won the awards of Best Performance and Best Director. Their special performance in the royal palace was well received and highly praised. This event created another miracle of student art exchange in Hebei Province. Ms. 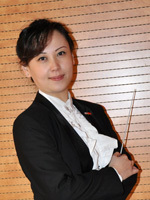 Fan Jie, Director of Hebei and Shijaizhuang Musician Association, Head and Conductor of Shijiazhuang Foreign Language School Symphony Orchestra. In 1999, Ms. Fan became a flute player of Hebei Provincial Singing and Dancing Theater and Hebei Symphony Orchestra. After that she attended various performances including China tours conducted by famous Chinese and foreign conductors like Li Delun, Huang Xiaotong, Bian Zushan, Mark Towotman (France), William Noll (USA) and Ding Yide (Germany). In 2001, she came to work in SFLS as Director of the school Art Center. The next year she was appointed Head and Conductor of SFLS Symphony Orchestra. Since then she has been applying herself to training the student members in rehearsing and performing Chinese and foreign works of different styles. Many times her students won prizes in large-scale national and provincial competitions. The many local and exchange performances of various degrees under her leadership were well-received and highly praised. She herself was successively awarded many titles such as 100 Outstanding Teachers Nationwide by China National Institute for Educational Research, Tutor of Outstanding Skilled Students by China Culture Development Foundation, 100 Outstanding Teachers Nationwide by Chinese Culture Information Association and Outstanding teacher in Chinese Youth Culture Display by Hebei Education Association. Ms. Fan’s achievements were once included in World Chinese Weekly. In 2009, Fan led his student musicians to Vienna Austria for the 38th Vienna International Youth Music Festival, winning the honor of Best Conductor. In 2012, she composed and published A Song for International Badminton Federation.